The Best Wine Youtube Channels from thousands of top Wine Youtube Channels in our index using search and social metrics. Data will be refreshed once a week. About Youtuber The Extract is a weekly video series dedicated to wine geeks and cork dorks from novice to expert. We talk shop with wine producers, growers, and makers from all over to bring you candid and honest discussions about wine philosophy, technique, and most of all...passion. About Youtuber Learn wine and meet the cool people who make it, serve it and drink it. Learn more, drink better: Wine reviews, values, expert tips, recipes, restaurants, news, videos & more. About Youtuber Hello friends! My name is Whitney. I'm a wine lady, entertainer, and party enthusiast living in Los Angeles. On the channel, I talk about wine, cocktails, entertaining, dating, travel and style with a generous dose of funny. About Youtuber Wine journalist and broadcaster Tom Cannavan is one of the UK's best known wine experts. His web site wine-pages.com was launched in 1995, and today enjoys over 450,000 unique visitors per month. Every Sunday, here on winepagesTV, he publishes a new Wine of the Week video reviewing a well-priced wine that offers top value for money and a really great drinking experience. About Youtuber Wine Express is the exclusive wine shop partner of Wine Enthusiast Magazine and Catalog. With daily virtual tasting videos hosted by Wine Director Josh Farrell, you can taste before you buy! We offer competitive pricing, great values and free shipping deals every day. About Youtuber Uncorking life in Sonoma wine country along with food, wine and travel tips. Welcome to our table. About Youtuber James Suckling is internationally regarded as one of the world's most influential wine critics. His website, JamesSuckling.com, features videos of key wine figures around the world. New content - including tasting notes and articles - is continuously being added to the site. About Youtuber Drink wine in moderation. Drink wine education from a firehose. Learn about grape varieties in our Wine Education 101 series, or dive into Winemaking terms and techniques. About Youtuber The Wine & Spirit Education Trust is the largest global provider of qualifications in the field of wines and spirits. WSET qualifications are formally recognised by the UK Government and have a strong reputation worldwide. In the Academic year 2013/14 56215 candidates sat a WSET examination. WSET currently has qualifications available in 62 countries in 18 languages. About Youtuber Wine Folly is a culture site offering articles and videos that will connect you to the world of wine. We travel around the world to curate the most awesome stories about wineries, regions and winemakers. About Youtuber Our So You Think You Know Wine? video series pits some of Canada's top wine critics and sommeliers in blind tasting action. About Youtuber Wine is one of life’s simple pleasures. Winc believes that the experience of getting a great bottle of wine should be as simple as enjoying one. Our team creates and curates over a hundred wines, and makes the experience of exploring wine easy and pleasurable. About Youtuber A passion for excellence in life and style. An appreciation for the craftsmanship and heritage of winemaking. Although the history of Bordeaux stretches back thousands of years, its story starts with you right now. Bordeaux is about enjoying the moment with a wine that suits your palate & setting. About Youtuber View engaging videos from Wine Enthusiast Companies including our events, plus helpful wine accessory how-to videos. About Youtuber Views expressed here do not represent views of Jacob's Creek and are not endorsed by Jacob's Creek. You must be of legal drinking age to follow and must not share with underage persons. Any links provided are for information purposes only, link to those websites at your own risk. About Youtuber Our Fine Wine & Good Spirits experts serve consumers online and at more than 600 stores across Pennsylvania. We look forward to educating you on the finer details of wine and spirits, while sharing food pairings, cocktails, and entertaining tips to help you cultivate great taste. About Youtuber A range of videos on various wine topics from wine journalist Jamie Goode's travels around the world of wine. About Youtuber We’ve just launched our channel dedicated to helping people learn more about wine, and demystify the technical language and unnecessary complexity around the field. About Youtuber Tasty Tales brings you short films about people who dedicate their lives to producing wonderful wine, beer and spirits. About Youtuber The Total Wine & More video channel is to share all the knowledge, fun and history about wine, beer or spirits with you. Our short videos tell you how to properly open a bottle of wine and Champagne, how to taste wine or beer, how to pair wine with food as well as spotlight on products, wineries and so much more. About Youtuber Welcome to the WineWeirdos YouTube channel, your source for concise and entertaining wine reviews. We discover and feature a variety of wines that focus on intriguing pedigree, great value and meeting the highest standards of wine nerds and enthusiasts. About Youtuber Inspired by "Apotheca," a mysterious place where wine was blended and stored in 13th century Europe, the wines of Apothic are truly unique in style and taste. About Youtuber We are Sheena & Sara, we are wine lovers who love to talk. Follow us on our journey to try new wines and find the ones we love. Our motto is to drink what you like! About Youtuber We're a refreshingly down to earth wine retailer in the UK. Come and explore our range of Wine, Beer and Artisan spirits. About Youtuber Welcome to Exotic Wine Travel, a platform that promotes wine culture and exotic wines from lesser-known regions. This channel is intended for anyone who enjoys wine, wants to learn more about wine, and is open to trying different wines. From casual wine drinkers to even sommeliers and wine educators, there’s something for you as long as you have an open mind and an adventurous palate. About Youtuber We'll never offer the bland, uninspiring, mass-produced wines so often found in supermarkets. Instead look forward to rapid delivery, award-winning service and -- most importantly -- the chance to discover some really great wines. About Youtuber Welcome to my channel! I am Michael, a sommelier that loves TRAVEL, FOOD and WINE. If you want to learn about wine and flavors in a fun and casual way, then this is the channel for you! About Youtuber wine.co.za is a content hub of electronically stored information on lip-smacking South African wines and the remarkable people and magical places behind these wines. Amateur or master, tradesperson or tourist, you are bound to find your own little nook of valuable information within this mammoth resource. About Youtuber If you like beer and want to know more or find about about some good ones to try then you are at the right place. Subscribe to my channel and stay posted on the various ones that I will bring to you with my reviews. These are unbiased opinions and I keep it honest. About Youtuber I do quirky reviews of wine under $15 and the occasional product review. If you like the video, remember to subscribe and click the bell enable notifications for when new videos are posted. About Youtuber I LIKE THIS GRAPE is the Voice of Modern Wine Culture. We bring wine culture to millennials by 'pairing' wine with fashion, film, food, and music through original digital content. We bring wine and the arts to life with correspondents on America’s east and west coasts and in Europe, China, and Africa: an irresistible and diverse army of award-winning talent with expertise in many areas. About Youtuber Let's have fun drinking and talking about wine. I may feature other libations at times as I am also well versed in liquors and beers having been involved in the industry. I have a few friends involved in the business including vineyard owners, winemakers, distillers, brewers, restaurant and bar owners, which gives me access to some unique products and perspectives. About Youtuber This is the official YouTube channel for LoCA - The Wines of Lodi, California. Here you will find videos about the passionate winegrowers behind our wines and gnarly old vines. About Youtuber Wine Compliance Alliance assists existing US wineries and those looking to start their own wine business. We can help with all aspects of TTB winery compliance, from required winemaking records and reports to federal excise taxes, label design and label approvals. About Youtuber I produce a weekly (well mostly weekly) wine show that features reviews of value wines (under $20), premium wines (over $20), and wine education. I also do Skype tastings, interview winemakers, winery owners (often the winemaker too), restaurant owners, sommeliers, and other wine personalities and people. About Youtuber Wine Australia supports a prosperous Australian grape and wine community by investing in research and development (R&D), building the international and domestic markets, disseminating knowledge, encouraging adoption and protecting the reputation of Australian wine. About Youtuber Welcome to Around the World in 80 Harvests & The Squeeze Magazine! We are sister-publications focusing on wine & travel videos. The Squeeze Magazine (www.thesqueezemagazine.com) explores the wine regions and travel destinations of the Southern Cone and sometimes further afield. About Youtuber The Secret Sommelier wine video channel shows regularly updated films of wine tastings, vineyard visits, winemaker interviews and much more. Discover our in depth looks into regions such as Champagne or Burgundy, or follow us to events in London where luminaries in the wine world discuss the vinous issues of the day. About Youtuber Great Wine Capitals Global Network is an alliance of eight major global cities in both the northern and southern hemispheres, which share a key economic and cultural asset – their internationally renowned wine tourism regions. About Youtuber Browsing through Just Wines website is an amazingly pleasurable experience for all wine lovers. Our online shop houses wines of exceptional quality from the most exotic wine regions of Australia and New Zealand. Our vision is to support Australian wineries, big or small, and give them a fair chance to sell their produce all over Australia instead of being concentrated in small areas. 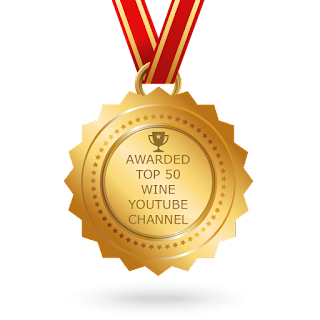 CONGRATULATIONS to every youtuber that has made this Top Wine Youtube Channels list! This is the most comprehensive list of best Wine Youtube Channels on the internet and I’m honoured to have you as part of this! I personally give you a high-five and want to thank you for your contribution to this world.